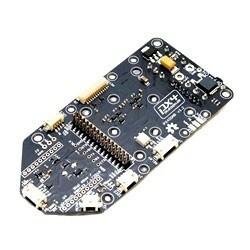 The PX4IOAR is an electrical and mechanical adapter board designed for the AR Drone and the PX4 FMU. Included in this kit is everything needed to mount the PX4 Flight Management Unit directly in an AR Drone. This means that you can easily remove the electronics supplied as standard in the AR Drone and install the PX4 boards. 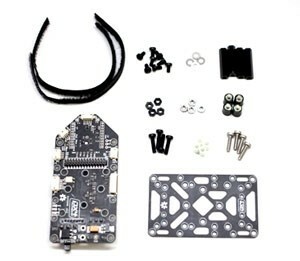 The PX4IOAR Quad Carrier is a complete mounting kit for the AR.Drone 1.0 and AR.Drone 2.0 frame, a battery power cable, battery, RC receiver and a short receiver cable (servo cable) needs to be added. Complete mechanical kit, requires an AR.Drone 1.0 or 2.0 frame, motors and propellers. Replaces the original AR.Drone main electronics and allows RC flight and autopilot development. Mechanical adapter board decouples the whole electronics and battery from vibrations. Battery mount / Velcro straps included. 5V/2.25A BEC power, relay, buzzer. XBee / Lairdtech radio slot. AR Drone motor controller interface. Includes necessary hardware to complete installation (spacers, bolts, etc). 4x M3 metal bolt long. 4x 25 mm M3 spacers. 8x M3 plastic bolt short. 4x M3 plastic bolt long. 200 mm x 7 mm Velcro straps for battery mounting.